The #1 solution to email and information overload is to get control of WHEN you check your inbox. This is the first of 3 life-changing strategies that I explain in my new webinar The WWW of Mastering Email Overload. Nathan’s new publication is an authoritative compilation of the 164 known solutions to email overload and interruptions. He is recognized as a global thought leader on research into overcoming information overload and improving ‘knowledge worker’ effectiveness. He has exchanged knowledge and solutions with scores of organisations worldwide and is the President and co-founder of the Information Overload Research Group (featuring members such as Google, IBM, Microsoft, Xerox etc). So, when his 20+ years of research lead him to write that the single most important strategy for overcoming overload is to ‘read email only in predefined daily time slots’, we should take notice. And my own research, combined with years of experience gained from working with thousands of busy professionals here is Australia leads me to the same conclusion. You will be far more productive by checking email in a scheduled block of uninterrupted time (‘single-tasking’) rather than checking it every few minutes when they arrive as an interruption (causing you to ‘multi-task’). So much of the productivity damage that email does, occurs not because of ‘what’ the email is but ‘when’ it arrives. 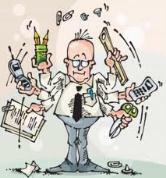 Email ‘as-an-interruption’ is a major cause of multi-tasking, but nobody truly multi-tasks – multi-tasking is a myth! A critical part of this strategy to ‘check email only at designated times’ is to also turn off all email alerts – both the audible and the visual. You want to be ‘blissfully ignorant’ of when emails are arriving as you have peace of mind knowing exactly when you will get to them. And Lachie Winterbottom from WDS Limited in Brisbane gave the same answer when I caught up with him more than 12 months after a workshop I presented for his team in Roma in central Queensland. Now, you might be one of many who fear that, by having all email alerts turned off, you will miss something urgent. And given that so many of us have been conditioned to rely on email for urgent messages, that is a very valid concern. However, email was never designed as a tool for synchronous communications (and doesn’t work well when we try to do it). We have much better tools for those types of synchronous messages – instant messaging, SMS or even a phone call. So the third part of this strategy is to manage other people’s expectations. This can be done in a number of ways. You can explain this verbally to those you work closely with. You can also send a short message explaining your new email policy, advising them that you only check email at certain times of the day and letting them know how to get through to you using a more appropriate communication tool such as SMS, a pager, ringing your mobile – whatever works for you. See example below. Some colleagues may become annoyed that they can no longer get the instant response by email that they used to get from you. But if you communicate that your new policy helps you become more productive and that they can still reach you with truly urgent messages by using your preferred method of communication, they will soon adapt to your new, more effective way of working and communicating. While the research indicates that for most people in most roles, best practice is to check email only at 4 planned times a day, there are many who feel that they have to check it more often. In those cases, the same principle of only checking it at designated blocks of time applies but the frequency increases and the interval between checking is reduced. For example, you might check email 8 times a day, once per hour for 15 minutes. The key is still to go to the inbox and ‘single-task’ your email and then get out of the inbox and single-task your other work, allowing you to be far more productive than trying to multi-task both. For those very few people that you may absolutely have to be available to for urgent messages, you can set up a rule that has all email alerts turned off except from selected people. This works well for anyone in a truly time-sensitive role, those in frontline customer service and for PA/EAs who need to be available for their manager. All of these strategies, and how to implement them, are demonstrated in the Taming the Email Tiger workshop and supported with follow up materials and resources showing the ‘how-to’ for each strategy. I explain this and the other 2 key strategies for getting control of email in the WWW of Mastering Email Overload webinar, so why not join us on-line to learn the life-changing strategies that will change the way you work forever? Have a listen and see what you think. Do you struggle to keep up with all your reading? When to email . . . or not ?